Arizona Roof Rescue » Blog » Did you know about these common commercial roofing problems? If you’ve had your business for years or are just starting up your dream, a sturdy and reliable building to host your business is important. Poor roof installation or maintenance can cause serious problems for your business that will add on a lot of extra budget needs. Being a professional roofer or a commercial roofing contractor is not an easy job. It is also very irritating to be customer with a poorly installed roof for their business. There are many small mistakes that could be made and may turn into huge problems in the future. Luckily, there are fantastic roofing repair contractors in the Valley that can take care of your problems, such as Arizona Roof Rescue. Debris or overgrown branches from tall trees could cause punctures in your roof. This is especially common when severe dust storms roll in and violently move tree branches around. This can be prevented by making sure tall trees are not too close to your roof. However, trees are very beautiful and can make your business look more homey and inviting. If you want to keep your tall trees intact and near your building, you can prevent potential roofing damage by maintaining or trimming the tree branches down to an appropriate length regularly. It is also important not to let these mistakes go unfixed for too long. Eventually the damage to your roof and interior of your business’ building due to leaking could become more costly and dangerous. Debris from plant matter or litter that has been swept up onto your roof during a storm makes your business look dirty and unprofessional. Even worse, debris that accumulates on the wrong parts of your roof can cause serious damage. Water may not flow properly off the sides of your roof and could become stagnant. When water collects on your roof, it could cause serious water damage, leaks, and possibly rotting. Proper roof maintenance and cleaning can help prevent this from happening. A secure, well-installed roof will have every shingle in place and secured well. Haboob season could wreck havoc on your Avondale business if the roof tiles are not installed properly. Missing shingles not only look tacky but will allow large leaks to damage your building’s interior. It is also important to note that even a good roof installation cannot prevent the fact that years of sun exposure, especially in the Avondale, Arizona desert, will cause shingles to deteriorate and break over time. It is important to maintain the shingles of your Avondale roof and replace them as needed. Should I seek out roofing services for my Avondale, AZ business if I’m in need of commercial roof repair? Seeking out a commercial Avondale roofing contractor may seem like a waste of money when you’re convinced you can repair your roof yourself. However, unless you are an accredited licensed roofer, there are a million mistakes you could make that may severely damage the foundation of your home. 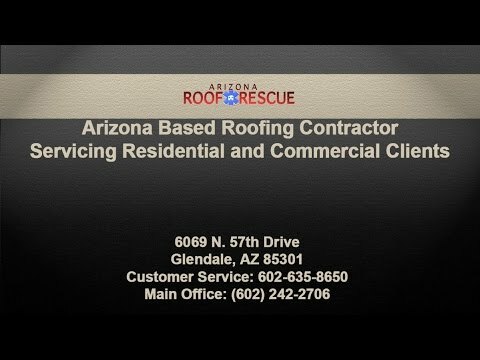 Why should I choose Arizona Roof Rescue? Arizona Roof Rescue provides excellent and trustworthy services to many cities within the Valley. Better Business Bureau attributions and reviews for very happy customers make Arizona Roof Rescue a company you can trust. Licensed, bonded, and insured, this contractor can help repair or install the roof of your residential or commercial building. Call us today for all of your commercial roofing needs! Home » Blog » Did you know about these common commercial roofing problems?